Many participants in the debate on U.S. policy in the Middle East have a lot invested in maintaining the idea of the Islamic Republic of Iran as a bogeyman forever to be feared, despised, sanctioned and shunned and never to be cooperated with on anything. The lodestar for this school of advocacy is the Israeli government of Benjamin Netanyahu, who proclaims to us nearly every day that Iran is the “real problem” underlying just about everything wrong in the region, and who adamantly opposes anyone reaching any agreement with Tehran on anything. Netanyahu does not want a significant regional competitor that would no longer be an ostracized pariah and that will freely speak its mind in a way that, say, Egypt and Saudi Arabia, with the other equities they have in Washington, cannot. He does not want the United States to come to realize that it need not be stuck rigidly to the side of, and always defer to the preferences of, “traditional allies” such as Israel and that it can sometimes advance U.S. interests by doing business with those who have worn the label of adversary. And of course the more that people focus on the “real problem” of Iran, the less attention will be devoted to topics Netanyahu would rather not talk about, such as the occupation of Palestinian territory. For those in Washington who wave the anti-Iranian banner most fervently, the waving is not only a following of Netanyahu’s lead but also a filling of the neoconservative need for bogeymen as justification and focus for militant, interventionist policies in the region. The anti-Iranian banner-waving of neocons, despite the abysmal policy failure of the Iraq War that should have closed ears to what they are saying today, finds resonance among a general American public that historically has had a need for foreign monsters to destroy as one way to define America’s mission and purpose. The prospective reaching of a negotiated agreement to limit Iran’s nuclear program has been a major concern and preoccupation of those who want to keep Iran a hated and feared pariah forever. An agreement would represent a major departure in U.S. relations with Iran. So the anti-Iran banner-wavers have been making a concerted effort for several months to undermine the negotiations and torpedo any agreement that is reached. Not reaching an agreement has become such a major goal that the banner-wavers have no compunction about taking the fundamentally illogical stance of exclaiming about the dangers of an Iranian nuclear weapon while opposing an agreement that would place substantially more restrictions on the Iranian program, and make an Iranian weapon less likely, than without an agreement. At least the anti-agreement forces have had a game plan, involving such things as hyping “breakout” fears and pushing congressional action that is disguised as support for the negotiations when it actually would undermine them. Now suddenly along comes a security crisis in Iraq, in which parallel U.S. and Iranian interests and the opportunity for some beneficial U.S.-Iranian dialogue are clear. Oh, no, think the banner-wavers, we didn’t plan on this. One detects a tone of panic in their jumping into print with emergency sermons reminding us that Iranians are evil and we must never, ever be tempted into cooperating with them. Then Doran and Boot go way into straw-man territory, saying the United States would be making a “historic error” if it assisted “an Iranian-orchestrated ethnic-cleansing campaign” carried out by ruthless Revolutionary Guards. Of course, the Obama administration isn’t talking about doing anything of the sort. We weren’t flies on the wall when Deputy Secretary of State William Burns talked earlier this week with the Iranian foreign minister about Iraq, but it is a safe bet that a theme of U.S. remarks was the need for greater cross-community inclusiveness in Iraq and the need not to stoke the fire of the sectarian civil war. Besides dealing with straw men, Doran and Boot here exhibit another habit of the banner-wavers, which comes up a lot in discussion of the nuclear issue, which is to assume that Iran will do the worst, most destructive thing it is capable of doing regardless of whether doing so would be in Iran’s own interests. What advantage could Tehran possibly see in propping up an increasingly beleaguered and unpopular Nouri al-Maliki with rampaging Revolutionary Guards? What Iranian interest would that serve? This gets to one of the things that Doran and Boot do not address, which is what fundamental Iranian interests are in Iraq, including everything those interests involve in terms of stability and material costs to Iran. Even if Iran had so much influence with Maliki that he could be said to be in Tehran’s pocket, what would Iran do with such influence? 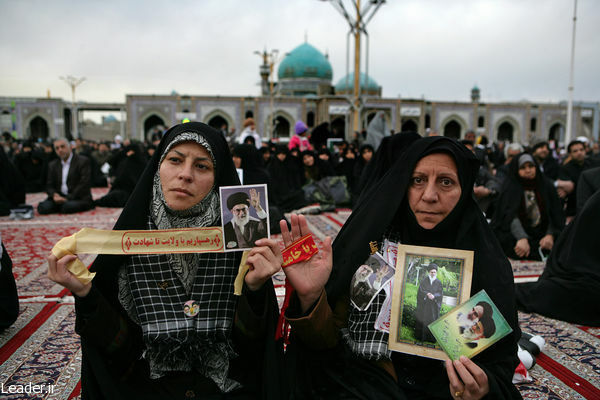 Here is displayed another habit of the banner-wavers, which is just to assume that any Iranian influence is bad, without stopping to examine the Iranian interests being served and whether they are consistent with, in conflict with, or irrelevant to U.S. interests. They do not offer any specifics. The only ones that come to mind involve a U.S. military intervention in Lebanon, U.S. support for Saddam Hussein’s Iraq in the Iran-Iraq War, a U.S. troop presence in eastern Saudi Arabia, and the eight-year-long U.S. military occupation in Iraq. Doran and Boot write that instead of having anything to do with the Iranians, we should develop a coalition of those “traditional allies” to prosecute a conflict on the “vast battlefield” that embraces Iraq and Syria. This sounds just like the talk of a coalition of “moderates” we heard during the George W. Bush administration. It right up to their doorstep strategy. Russia has Ukraine. China has Vietnam Nam. Iran has Iraq. What these three countries need to do, is restrain themselves. Did I mentioned who control’s the narrative? The U.S. & Company own most of the world’s media, but what the genius’s forget, is people aren’t stupid. I guess if you can manage to make some believe the U.S. never lost a war, then you’ll always be on the right side of history. Where the U.S. could lose out is if Germany, Japan, And Turkey were to flip sides. The BRIC countries are working hard to eliminate the U.S. dollar. If this continues, then what? Germany not only buys 30% of its nature gas, and 40% crude from Russia, it has 3000 German business’s doing business in Russia. Japan and Russia are linking up to provide a pipeline from Russia to Japan. Turkey….hmm will they fine it better to do business with China, and be nice to the Kurds? So many wheels turning, but yeah we should just bomb Iran…that’s what we should do! I would like to have seen the banking mentioned as that seems to be a major reason for hating a country. In the year of 2000 the countries whose economies operated without a privately owned central bank, were: Afghanistan, Iraq, Sudan, Libya, Iran, Cuba, Syria and North Korea. We have taken care Libya, Iraq, and Afghanistan leaving the terrorist hotbeds of Iran, North Korea, Syria and Cuba still uncontrolled by a central bank. Some would say a Rothschild controlled central bank. Banking seems to always be related to the west hating countries.